Khangsar Tenpé Wangchuk (1938-2014) was born amidst rainbows and beautiful sounds in Akyong Khangsar in Golok on January 1, 1938. Due to this he was given the nickname Tsilak, auspicious date. He showed signs of his capacity in his early childhood. When he was three, instead of playing childhood games, he pretended to be a lama. Besides playing with ritual objects, he set out rocks and acted as if they were students receiving empowerments and teachings from him. People were amazed by his behavior. When he was asked where he came from, he pointed south toward his first incarnation’s hometown. During this time an elderly woman asked if he would give her teachings when he became a great lama in the future. He responded by shaking his head no as he knew with foresight that she would already be dead when he would begin teaching. At age seven many lamas recognized him as the reincarnation of Payak Önpo Rigdzin Dorjé, an emanation of Yudra Nyingpo, who was one of Guru Rinpoche’s twenty-five disciples. He was enthroned with a large celebration. At age eight he began studying Tibetan texts but had difficulties that caused his teacher to beat him. After one such beating, he went outside and fell asleep. While dreaming he had a vision about a monk and was taught a special ritual. When he returned the next day to study texts, he understood everything. From this point on, everything he learned came easily. He received a wealth of teachings from such amazing teachers as Palyul Choktrul Jampal Gyepé Dorjé and Akyong Tokden Rinpoche Lodrö Gyatso. During a tsok feast, one of his teachers, who was a student of Adzom Drukpa Rinpoche, gave him a full glass of alcohol and told him to finish it. Upon drinking it, all of his thoughts stopped and his teacher gave him Dzogchen instructions that caused teachings, songs, and poems to spontaneously manifest in his mind. Due to his incredible capacity, he started teaching when he was only fifteen years old. During the Chinese invasion Khangsar Tenpé Wangchuk was imprisoned. While in jail he had many dreams and practiced diligently, including reciting Padmasambhava’s mantra one billion times. During his imprisonment he met his root teacher, Tokden Rinpoche, and many other incredible teachers with whom he had the wonderful opportunity to exchange teachings. After his release he built Golok Chikdril Khangsar Taklung Monastery and Payak Monastery, a university and retreat center. He had many visions and was able to talk with Padmasambhava, the ḍākinīs, and the dharmapālas. He received many teachings from these deities during these visions that allowed earth- and mind- terma treasure teachings to spontaneously occur that were sometimes revealed in public. His lifestyle reflected his bodhisattva qualities. He sold almost all of his belongings to release billions of animals. He gave year-round teachings tirelessly , including annual summer Dzogchen instructions. Khenchen Jigmé Phuntsok described this great Dzogchen master as a high-level bodhisattva. On April 13, 2014, during the time of a full moon eclipse, he passed away at age seventy-six. And for the ordained sangha in particular, let there be harmony, perfect observance of the vows, and service to the teachings. Please, never forget this advice. In 2013, I met Khangsar Tenpé Wangchuk during a month-long Dzogchen teaching. Initially I was hesitant about attending because I felt no connection to the teacher and believed that I had already received enough teachings. But, one of my cousins, who had met this great Dzogchen master, encouraged me to go. My cousin told me that my experience meeting Khangsar Tenpé Wangchuk would be special and different than the teachings that I had received before. Due to the good opportunity to travel there together with other khenpos from my monastery in Pukang, I decided to attend. At first I did not experience a strong connection, but once Khangsar Tenpé Wangchuk began teaching, the connection grew as his teachings were very unique and amazing. I requested the pointing out instructions from him. Although three thousand were attending the regular teachings, Khangsar Tenpé Wangchuk only gave the pointing out instructions to ten students at one time. In my group, three had never received pointing out instructions and seven had from other teachers. Khangsar Tenpé Wangchuk’s instructions were very special and spontaneous. During those forty minutes, we, the students, were powerfully hit by each word of his instructions. I often experienced no thoughts and everything stopped. On the last day of the month-long teachings, I met with Khangsar Tenpé Wangchuk and was offered a CD about his Dzogchen teachings if I promised to teach others. I accepted immediately. Khangsar Tenpé Wangchuk also told me that he had practiced ten different preliminaries, but he had recognized the nature of mind through the blessings of practicing The Chariot of Liberation. I was given the reading transmission and encouraged to practice this profound preliminary myself and give it to my students. Please subscribe to our newsletter for video teachings from Khenpo Sherab Sangpo and updates to our event calendar. Your contact information will not be shared and you may unsubscribe at any time. is a professor in the Nyingma lineage of Tibetan Buddhism. He trained with some of the greatest meditation masters of Tibet and has spent over 25 years contemplating the profound philosophies of the Buddhist tradition, including several years meditating in solitary retreat. He travels the world teaching at monasteries in Tibet and Nepal, as well as at meditation communities in Asia and Europe. He is the Spiritual Director of Bodhicitta Sangha | Heart of Enlightenment Institute with sanghas in Minneapolis and Duluth, Minnesota. He teaches in English and is loved for his joy, laughter, and loving-kindness. 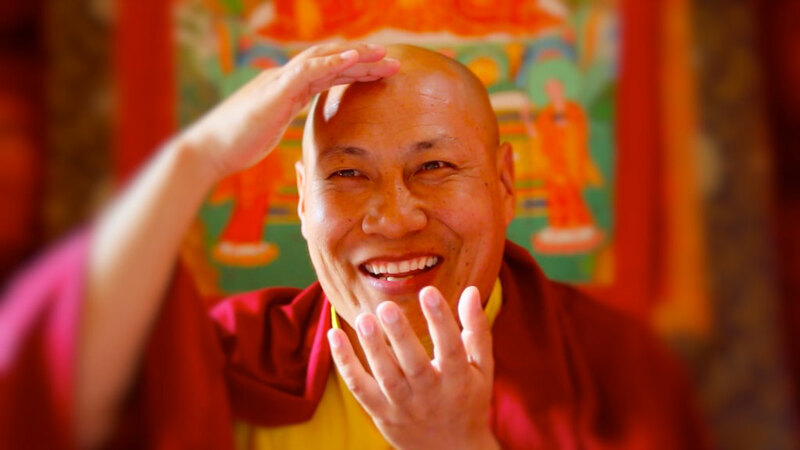 Read about Khenpo Sherab Sangpo's education and lineage. To request an appointment or ask practice questions, please email our Teachings Coordinator, Kate Thomas (Gyurmé Chötso). If you have questions about teachings or our curriculum at Bodhicitta Sangha, refuge vows, or practice interviews with Khenpo Sherab Sangpo, please call Kate Thomas at (651) 647-6767, or email Kate Thomas (Gyurmé Chötso). If you would like to share your skills as a volunteer with our meditation community, please call Kelly O'Neil at (952) 201-1053, or email Kelly O'Neil. If you need assistance with retreat registration, please call Colleen Hartwell at (520) 404-8489, or email Colleen Hartwell. If you have questions about how to make a tax-deductible financial gift to support our 501c3 non-profit meditation community, please call Mary MacEachen at (651) 246-2764, or email Mary MacEachen. © Bodhicitta Sangha | Heart of Enlightenment Institute | website by Lotus + Lama, Inc.